le chaudron de vulcain – February 12 , 2019. EN. Costa Rica : Poas , Peru : Sabancaya / Ubinas , Ecuador : Reventador , Indonesia : Karangetang . February 12 , 2019. EN. Costa Rica : Poas , Peru : Sabancaya / Ubinas , Ecuador : Reventador , Indonesia : Karangetang . Home / blog georges Vitton / February 12 , 2019. EN. Costa Rica : Poas , Peru : Sabancaya / Ubinas , Ecuador : Reventador , Indonesia : Karangetang . Poas Volcano Activity Report, February 11, 2019. 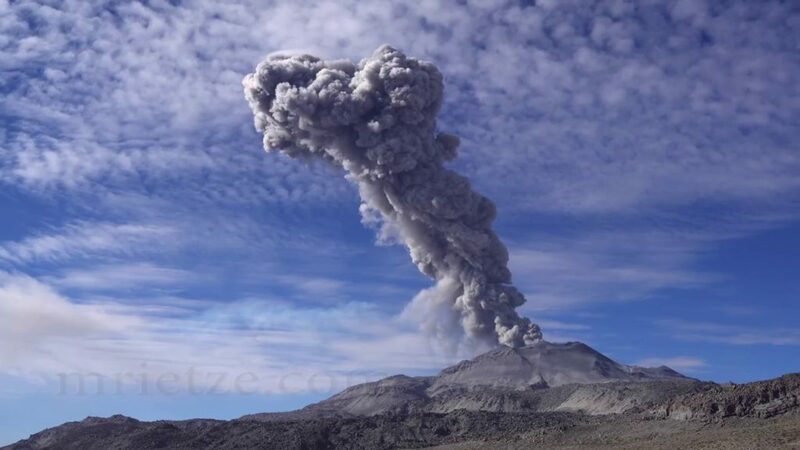 On February 11, 2019 at 01:50 local time, an eruption is recorded on the Poas volcano, with a column that rises 200 meters above the crater height and 2908 m.s.n.m. (meters above sea level, 9538.24 ft). Duration of the activity: in progress. Sulfur odor reported in: No sulfur odor reported. Comments: Passive eruption of Poás volcano around 01:50 this morning. The eruption persists until this moment. The plume is weak and dispersed to the southwest. The seismic activity is similar to that of yesterday. The incandescent in the Poás started at 1:51 in the morning. The ash emanation then continues, the wind carries materials and gases in areas located southwest of the volcano, especially to Grecia and nearby cities such as Cajón and San Luis. February 11, 2019. The direction of the wind is maintained towards the South-West, so the influence of the gases and ashes emitted by the Poás volcano is mainly oriented towards Grecia and its surroundings. Precautions are recommended, especially for those with a predisposition to asthma and / or allergies. Do not leave the house or use the protection as masks on the airways. 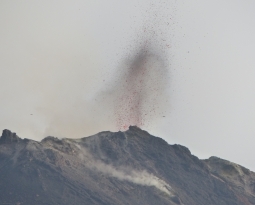 The columns of gas and eruptive ash reached a maximum height of 3000 m above the crater; Estimated height with little visibility due to cloudiness in the volcano area. The dispersion of these materials occurred within a radius of about 30 km, mainly to the south and southwest. A thermal anomaly was recorded according to the MIROVA system, with a value of 10 MW VRP (Radiated Volcano Power). 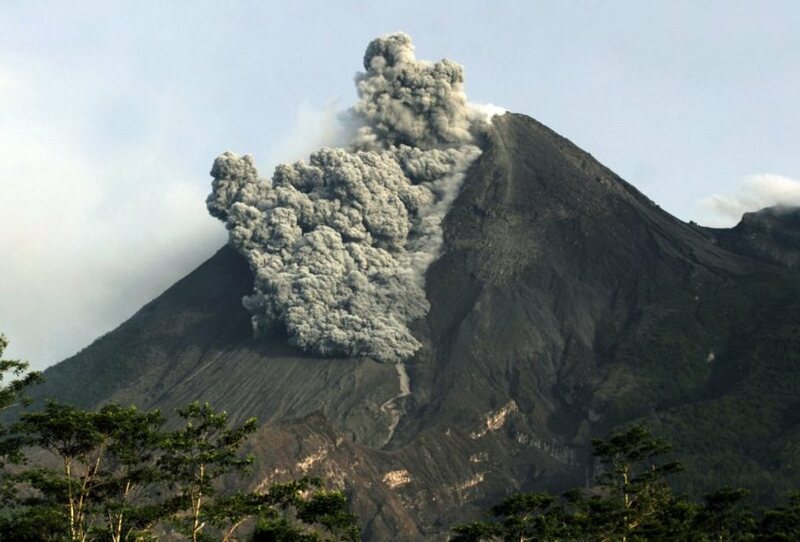 On Thursday, February 7th, the presence of lahars on the volcano Ubinas was recorded again. It has been identified by the geophysical monitoring network installed by the IGP on this massif. 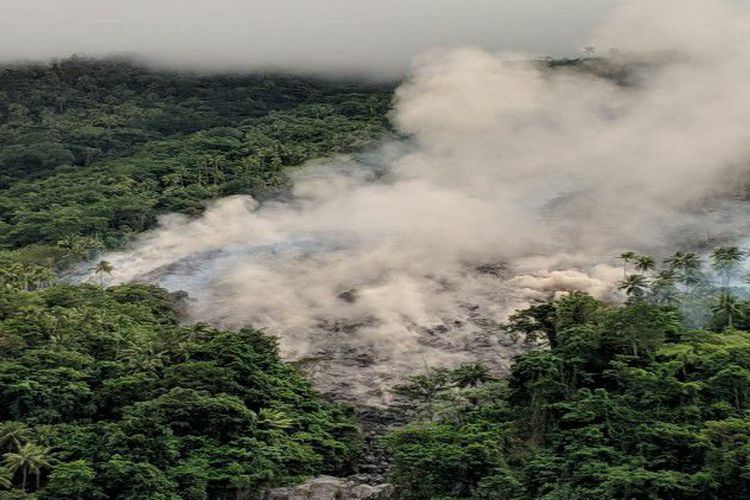 These flows have descended into the volcanoes of Volcanmayo and Chiflón, located on the southeast flank of the volcano, causing the interruption of traffic on the entry and exit road to the city of Ubinas. The UBI5 and UBI6 stations, strategically installed by the IGP for the detection of lahars, recorded a variation of the seismic signal at 18:53. 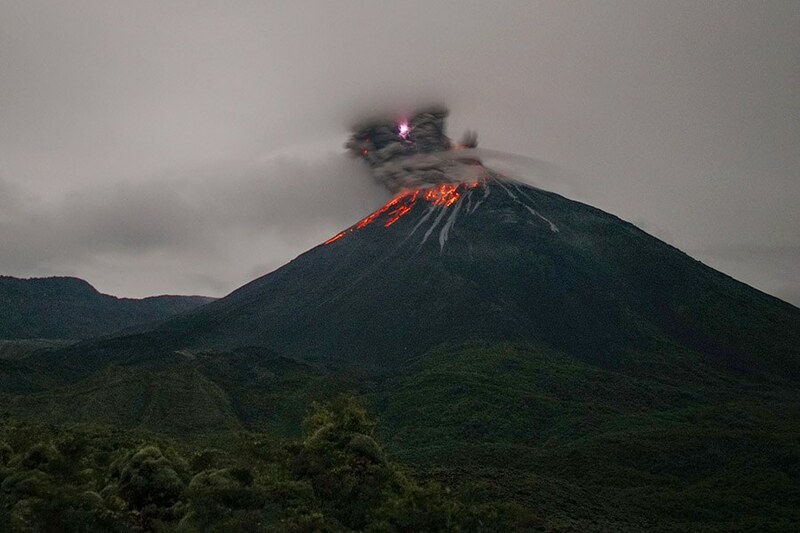 (local time), which increased its amplitude around 19:20. m. This change indicated that the flows passed through the volcanoes of Volcanmayo and Chiflón at the altitude of said stations, towards the river Ubinas, the same which flows 1 km from the city of Ubinas and near Tonohaya. Immediately and after confirmation of the events, a notification was issued via the mobile application « Volcanes Perú », informing the Civil Defense Office of Ubinas and COER Moquegua. « This is the third lahar we recorded last week.The communication via the mobile application developed by the IGP and coordination by the National Volcanic Center of Arequipa allow authorities to act on the basis information in real time, « said President Hernando Tavera, IGP Executive Chairman. Due to the fact that the rain conditions in the Moquegua region will be maintained, as indicated by SENAMHI in its latest weather warning, the IGP recommends that the population of the Ubinas Valley be attentive to the appearance of new lahars. 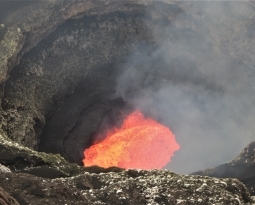 , which descend by the streams of the south and south-east flank of Ubinas volcano. Photo : Martin Rietze , Auteur Inconnu. Seismicity: There are no data on seismicity. 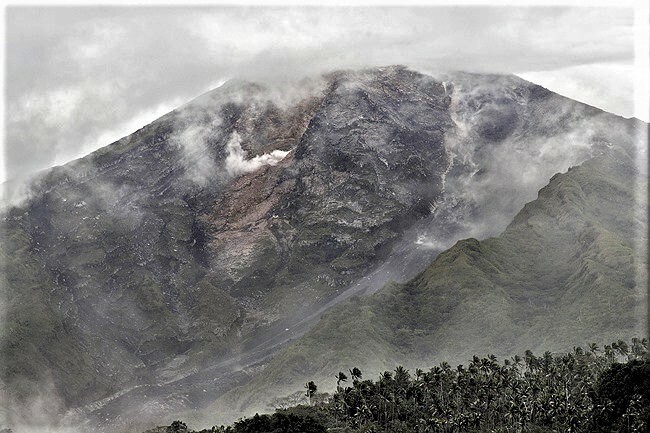 Rains / Lahars: The monitoring of the Reventador volcano reports that early this morning, there was light rains in the area, without generating lahars. Emission column / ash: No emissions observed. Other monitoring parameters: At present, there are technical problems in the reference station; for this reason, there are no data on seismicity. Observations: The volcano has remained cloudy for the past 24 hours. Activity Level at Level III (SIAGA). G. Karangetang (2460 m altitude) has been reinstated since 25 November 2018. Since yesterday and until this morning, the volcano was clearly visible then covered with fog. 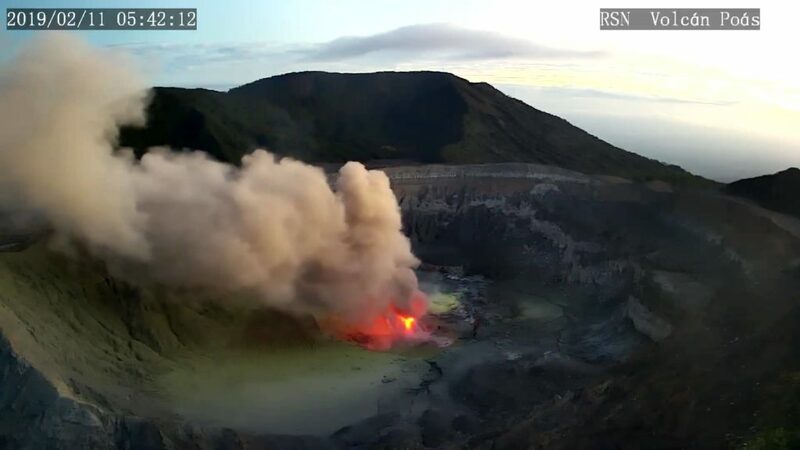 It was observed that the smoke from the main crater was thick, white and reached 150 m. The plume of smoke emitted from crater II was observed, stained in gray – white, up to 50 m above the summit. The wind was faintly blowing south and west. A low to fairly loud roar was heard at the PGA post. The length of lava flow in the river is greater than 3500 meters from crater II. At the end of the lava flow, there was evaporation which caused a thick puff of white smoke. Avalanches on the edges of the flow often occur, causing brown smoke, sometimes gray / blackish, thick. 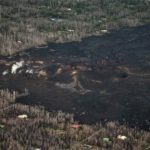 Currently, the lava flow has reached the sea. People around Karangetang and visitors / tourists should not approach, climb or move in the danger zone located 2.5 km from the summit of Kawah Dua (North crater) and the main crater (South) and within Sector expansion zone from Dua Crater west-northwest over 3 km and north-north-east over 4 km. 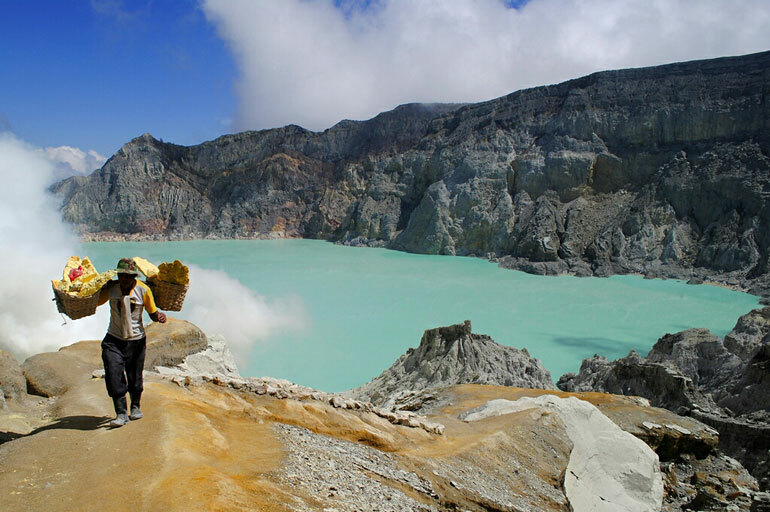 Communities around Karangetang in the Northwest Kawah Dua region, including Niambangeng Village, Beba Village and Batubulan Village, should be evacuated to a place protected from the threat of lava or cloud Hot. Gunung Karangetang’s lava flow seemed to burn a number of trees (Karangetang volcano observation document). People living around rivers from the summit of Mount Karangetang need to be better prepared for the potential threat of lahars and sudden floods that can spread to the coast. It is recommended that the community around Mount Karangetang prepare a mask for the nose and mouth to prevent the risk of airway disruption in case of ash rain. The last YELLOW color code was published on November 25, 2018 at 13:32. 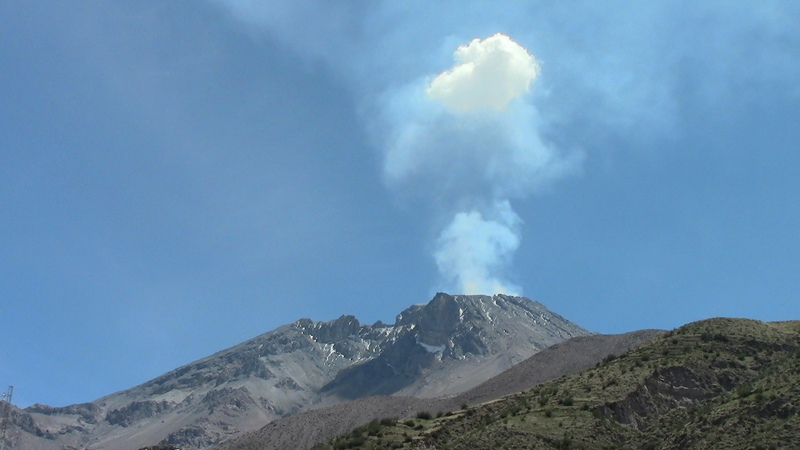 This code concerned the emission of volcanic ash at an altitude of about 2284 m above sea level or about 500 m above the summit, the wind blowing east. Photos : Borneo bulletin , PVMBG/ Kompass . 12 Fevrier 2019. FR. Costa Rica : Poas , Pérou : Sabancaya / Ubinas , Equateur : Reventador , Indonésie : Karangetang . 13 Fevrier 2019. FR . Colombie : Nevado del Huila , Hawaii : Kilauea , Indonesie : Ibu , Costa Rica : Poas .